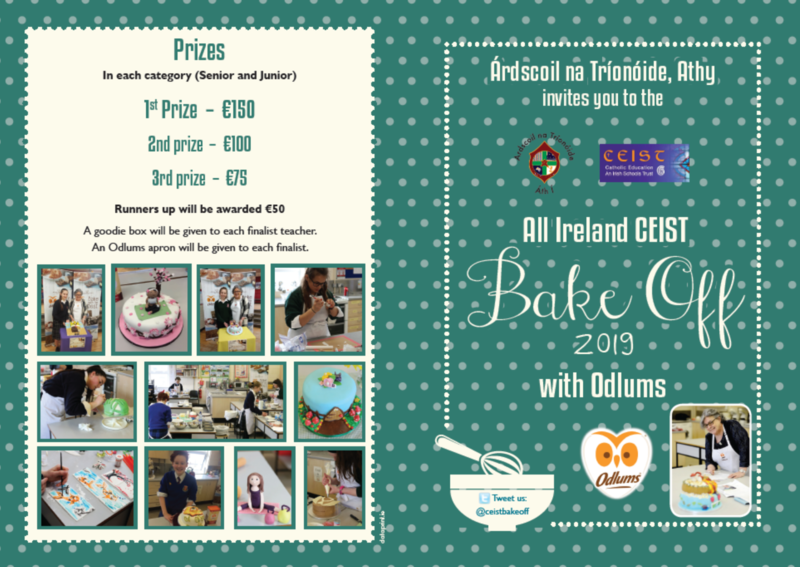 Árdscoil na Tríonóide, Athy invites you to the All Ireland CEIST Bake Off 2019 with Odlums. See below for full details. We are delighted to announce the launch the fifth CEIST All-Ireland Bake-Off which will take place in Ardscoil na Tríonóide, Athy in March 2019. The competition is sponsored again this year by Odlums. The queen of baking, Catherine Leyden from Odlums and Ireland AM, is chief judge. The competition is designed to give students the opportunity to tap into their design and creative skills and give it expression through culinary art. Many schools around the country hold their own bake-off to give students the chance to develop these skills and achieve a sense of fulfillment. The competition also raises the profile of Home Economics within the school curriculum. Links are forged as students and teachers from all over the country spend an enjoyable day together. This year’s bake-off has a junior and senior competition. The senior competition features the theme of “Family” while the junior competition is open. All details (brochure and registration form) have been sent out to each school during the mid-term break. To be part of the competition all you need to do at this point is fill in and return the registration form to Ardscoil na Tríonóide on or before 19th November 2018. We will then send you on application forms and final details. The competition is fully compliant with General Data Protection Regulations(GDPR) 2018. We encourage as many schools as possible to take part and send on their entries in February 2019. 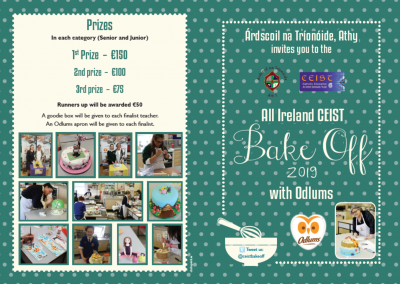 Follow the competition on Twitter @ceistbakeoff or contact the organisers, Jackie or Margaret, by phoning Ardscoil na Tríonóide at 059-8633151 if you have any queries.